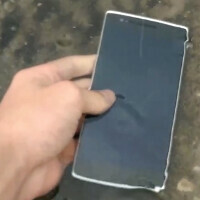 With some manufacturers adding protection to the elements with their new flagship models, a video has just been posted to YouTube showing the OnePlus One being tested to see how the device stands up to water. The phone has not been certified. In comparison, the Samsung Galaxy S5 features an IP67 certification, which means that the phone can withstand a submersion in water as deep as 3.2 feet, for as long as 30 minutes. The testing was made up of taking the phone out in the rain, and then dropping it inside a few puddles for as long as ten seconds. In each case, the OnePlus One lived through the dunking, although without a certification rating, there is no telling how much water the flagship handset can take. According to one member of the OnePlus team, getting the phone certified would have cost too much money, driving up the price of the handset in the short term. The problem is, without the certification number, who really knows how much the OnePlus One must be protected from the elements. Even testing the phone by putting it inside a puddle for ten seconds, doesn't mean that it will always be protected from water. If you do own the phone, or plan to, use common sense and try to keep your phone dry. The video, by the way, was filmed using the HTC One (M8), which is IPx3 rated. That means that the phone is protected from water spraying up to 60 degrees from vertical at 10 liters/min at a pressure of 80-100 kN/m2 for 5 min. In other words, taking your HTC One (M8) out in a light rain, like what we witnessed in the video, is okay. Good grief, what a waste. A couple wasted minutes of my life I'll never get back. Waterproof test ha! So we get another marketing gimmick from OnePlus. This is a company that seems to thrive on negative feedback and alienating potential customers. How is this a marketing gimmick? Did OnePlus make the video? Have they said anything about water resistance? Jeez you're boring. How come some people like you do not support an emerging company which provides the best utility to money ratio, unless you are biased or paid? Because the company is dishonest and deceitful. And instead of doing things to build customer trust, they've done the opposite. If you look EVERYWHERE on the Internet, there are tons of people who are unhappy with the marketing gimmicks, hunger games, invites, fake launches, etc. that OnePlus has employed since the beginning of the company. When there are defenders of shady and deceptive marketing practices, vapor launches, reveals that are run by the company that take over six months, those are the people who are obviously the paid shills. Have you heard of xiaomi? Even they give best value for money products and they are much better than this company. Xiaomi is already a hit in Asian markets and soon coming to Europe . Aren't bored of hating on almost every company? You need help, man! H2O is the water's name in chemistry.....hydrogen 2 oxygen . Yeeeah :) Though it's already tomorrow here. Well depends from your point of view. No I just made a joke. But you're right. I think its just that the general build quality of smartphones has become quite precise and intricate, therefore allowing less gaps and a tighter construction. Although both the One Plus and the HTC's Ones arent water resistant/proof certified, they can even be dunked in for a short while. That guy must've seen stupid from other people's point of view, he was walking around barefoot then putting his phone in the puddle, walking around and put it in the puddle again, and again. Why the heck didn't he do it indoor? You can use shower and a basin to do shower and dunking test. I call this one a phantom test since a mass produced O +One doesn't actually exist what for??? tired of the hype that only caters to few stop it already! Glad it was still working. i like my ZZKKA brand waterproof case, i buy from amazom. if you guys how want it. i can do recommed.search "zzkka" on amzon.com haha.